Heathdale features the Julie Norris Post Collection of Ericaceous and Appalachian Plants in a secluded cove nestled east of and below the Peony Garden. Ericaceous plants, which are members of the heath family, have specialized relationships with soil fungi. In our climate many of the azaleas and their relatives need acid soils to thrive and a protected site that is sheltered from summer heat and winter cold—conditions that are maintained here. Many of the plants featured in Heathdale are common in the Appalachian Mountains. In collaboration with Matthaei-Nichols staff members, Doris Duke Conservation Scholar intern Jessica Riojas created a compelling, visually rich story map of Heathdale. Click here to see Jessica’s story map. As spring progresses from May to June you will find a progression of bloom from mixtures of numerous azaleas (Rhododendron spp. ), evergreen Catawba and Rosebay rhododendrons (Rhododendron catawbiense and R. maximum), along with dog-hobble (Leucothoe fontanesiana) and mountain laurel (Kalmia latifolia). In addition to the native oak-hickory forest setting, other attractive plants include hemlock (Tsuga canadensis, T. caroliniana, and T. sieboldii), various dogwoods (Cornus spp. ), witch-hazel (Hamamelis virginiana), sassafras (Sassafras albidum), and masses of native ferns and woodland wildflowers. Some of these plants date from plant collecting expeditions in the 1920s, while others have been added in the past decade. Heathdale is at the Nichols Arboretum site. Through generous gifts from the Post family, the Julie Norris Post Heathdale Collection is endowed. Annual disbursements and other gifts help fund the continued maintenance and care of this special location. Opportunities exist to endow and name other areas of Matthaei Botanical Gardens and Nichols Arboretum. For more details, please contact our director of development, Meredith Olson: merolson@umich.edu; 734.647.7847. 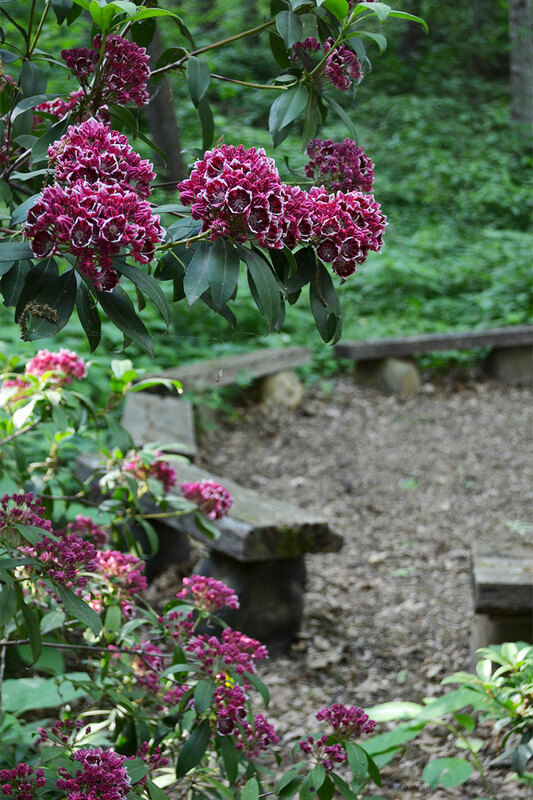 Mountain laurel (Kalmia latifolia) is native to North America and can be found growing in the Heathdale in Nichols Arboretum. 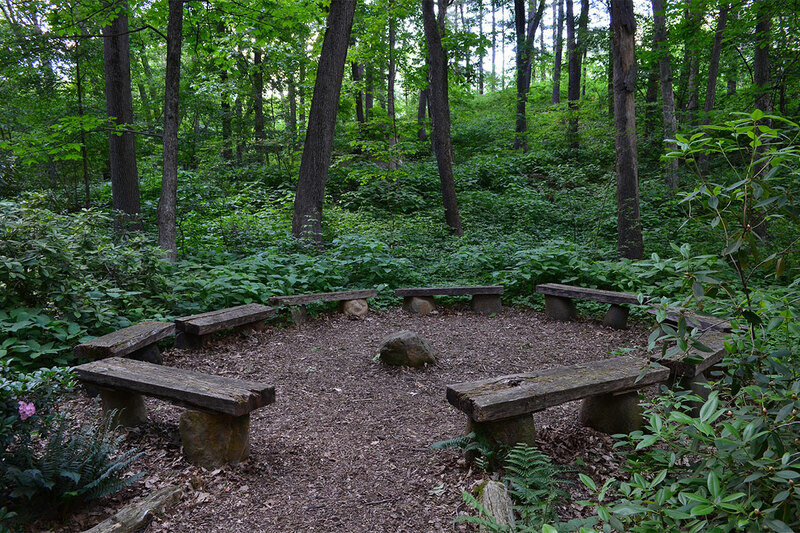 The council ring in the Heathdale at Nichols Arboretum. The council ring was inspired by renowned Danish-American landscape architect Jens Jensen, who worked in the early decades of the 20th-century.